Calcium caseinate (90%), non- and partly hydrogenatedcoconut fat (contains milk), flavours, emulsifier (soy lecithin), thickener(sodium carboxy methyl cellulose), salt, vanillin, acidity regulator (potassiumtartrates), sweeteners (sucralose, steviol glycosides), colour (tartrazine)***. *** May have an adverse effect on activity and attention in children. Made ina plant that manufactures milk, egg, gluten, soy, crustaceans, sulphur dioxideand nuts containing foods. 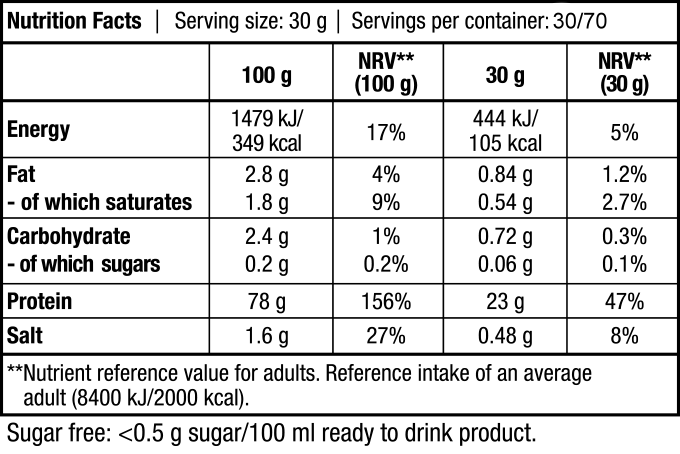 Calcium caseinate (85%), cocoa powder, non- and partlyhydrogenated coconut fat (contains milk), flavours, salt, thickener (sodiumcarboxy methyl cellulose), emulsifier (soy lecithin), acidity regulator (potassiumtartrates), sweeteners (sucralose, steviol glycosides), vanillin. Made in aplant that manufactures milk, egg, gluten, soy, crustaceans, sulphur dioxideand nuts containing foods. Calcium caseinate (89%), flavours, non- and partlyhydrogenated coconut fat (contains milk), acidity regulators (citric acid,potassium tartrates), emulsifier (soy lecithin), thickener (sodium carboxymethyl cellulose), salt, sweeteners (sucralose, steviol glycosides), colour(Allura Red AC)***. *** May have an adverse effect on activity and attentionin children. Made in a plant that manufactures milk, egg, gluten, soy,crustaceans, sulphur dioxide and nuts containing foods.